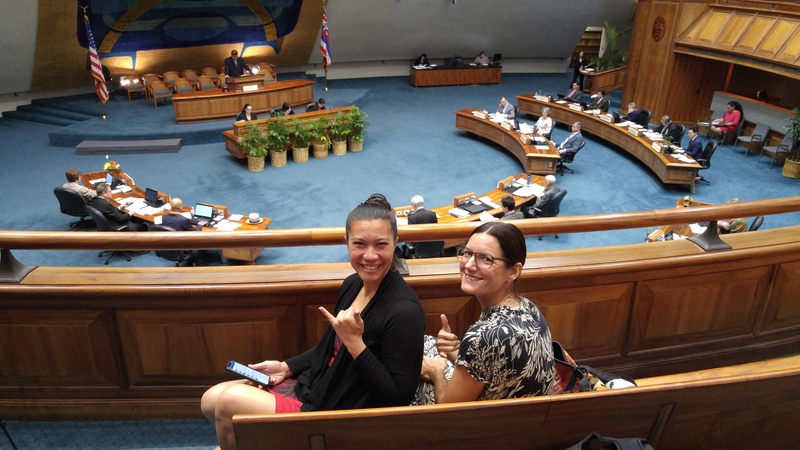 Jubilant smiles as the Senate embraces pesticide regulation and banishes chlorpyrifos from Hawai‘i. 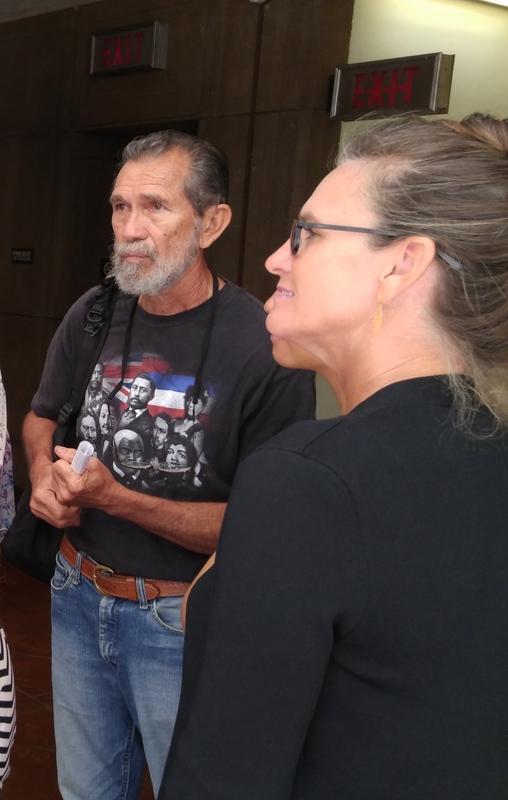 Keani Rawlins-Fernandez, Molokai mom, lawyer, activist (left) with Anne Frederick, Executive Director of the Hawai‘i Alliance for Progressive Action, a member of the “Protect our Keiki” coalition. Walter Ritte and Tina Wildberger were among many Neighbor island residents tracking the bill. Scientists raised the alarm. Doctors raised the alarm. The American Academy of Pediatrics (AAP) raised the alarm, warning that “the risk to infant and children’s health and development is unambiguous.” Sickened teachers and schoolchildren raised the alarm. Mothers who found traces of pesticides in their children’s hair raised the alarm. People who became inexplicably sick raised the alarm.Hawaii’s famed Trades delivered, not just the islands’ signature gift of balmy breezes, but with it a noxious payload of poison to playgrounds and neighborhoods in places like Kauai’s west side. The taint of pesticides in the air, the soil, and the water of fragile ecosystems endangered bird and marine life. It endangered children, and babies still in the womb. It put pregnant women at risk. 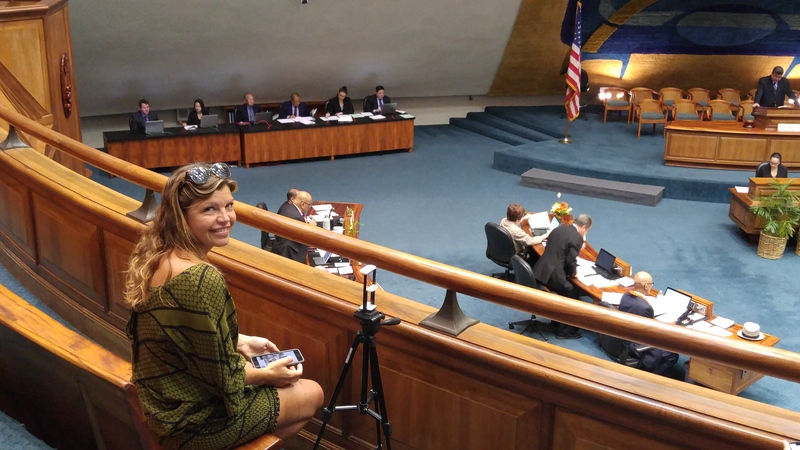 Autumn Rae Ness of the Hawaii Center for Food Safety live streams the historic vote banning chlorpyrifos. Thousands took to the streets over the last few years to demand protection from the pernicious effects of acute and chronic exposure to Restricted Use Pesticides on these verdant islands. Court battles were fought. And won. And lost. And continued. But TODAY signaled a new beginning. 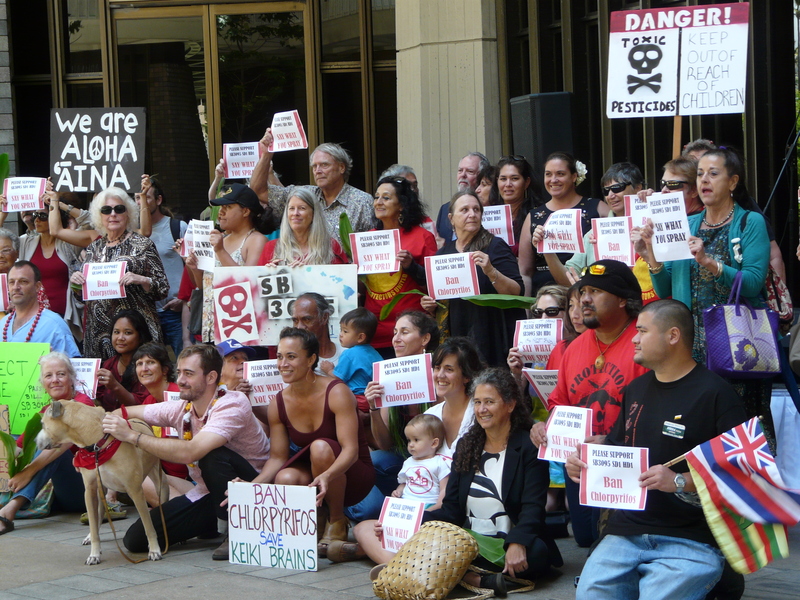 Today Hawai‘i declared victory by doing what the Environmental Protection Agency (EPA) had failed to do. Today Hawai‘i banned the deadly descendant of World War 1 nerve agents: chlorpyrifos. Gary Hooser, Founder President of the Hawai‘i Alliance for Progressive Action (H.A.P.A.) 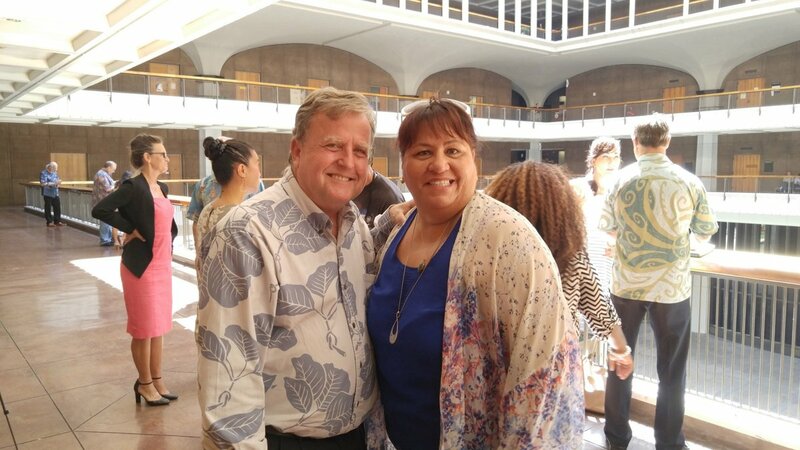 with Maui-based teacher, Mish Shishido at one of many hearings at the State Capitol. “Lots to celebrate today,” said Gary Hooser, Founder President of the Hawaii Alliance for Progressive Action (H.A.P.A.). “The people spoke, and this time lawmakers listened. Our families have some much-needed protections against powerful neurotoxins that we know are harming our children, pregnant women and families who are exposed to pesticide drift,” he said. “We count on lawmakers and regulators to remain vigilant in ensuring that corporations don’t put profits before the well-being of the community,” he said. Lauryn Rego who serves on the advisory board of the Hawaii Center for Food Safety was especially pleased by the disclosure and reporting requirements. “Agrichemical companies that use Hawaii as their open laboratory now must report what they spray, how much they spray, and when and where they spray the powerful pesticides they have been using. We have been asking for, but have not had this kind of critical information before. Today that changes,” she added. Molokai mother, lawyer, activist, Keani Rawlins-Fernandez, whose child goes to an immersion school on Molokai that is across from Monsanto fields, welcomed the news. “At long last! Exposing our children to poisons is not the price we want to pay for cultural immersion,” she said. The Public Report Summary will help residents and visitors make decisions about where to live or where their children should attend school. The “individual entity reporting data” gathered annually will prove useful for research and testing. The ban on chlorpyrifos will take effect in January 2019. Companies that need more time to respond to the ban may apply for extensions via temporary permits. After 12/31/2022 there will be no exceptions and chlorpyrifos will be banned from all use in the state of Hawaii. The community most recently made its views known and its voices heard at a rally at the State Capitol in early April. “This was a law that was years in the making. Its time had come,” said Senator Ruderman, the bill’s primary introducer, who along with co-introducers Senators Josh Green and Rep. Karl Rhoads, were among the earliest supporters of the bill. “We have been guided by the belief that we must always put our keiki first. On that we should all agree,” said Ruderman. The world’s largest agrichemical companies, such as Monsanto, Dow, and Syngenta, experiment and develop their genetically engineered crops in Hawai‘i. Testing and development of these crops result in repeated spraying of dangerous chemicals. including thousands of gallons and pounds of RUPs in Hawai‘i each year.Many of their operations are adjacent to schools and residential areas, putting children and public health at risk. Passage of SB3095 today will be remembered as a watershed moment in what has been a long fight to put people first. To put keiki first.